New Posh signing George Moncur believes his double against Port Vale will not be the end of his goalscoring for the club. The attacking midfielder signed on loan from Barnsley on deadline day and marked his debut on Saturday (September 10) in style with two low finishes. The second in the 84th minute appeared to have given his side a win but they conceded a 94th minute penalty which Alex Jones scored to make it 2-2. Jones had given Vale a sixth minute lead before Moncur struck in either half. He said: “I’m delighted to score two goals. It’s really nice to score the goals but I’m disappointed with the draw. “That’s what I try and do in every game, I try and get shots off. Fortunately I got two goals. I’m sure if I keep playing I’ll get more goals, but more importantly we need to get some wins. “Attacking, we cause any team problems. I think we are really solid at the back but it’s just about game management towards the end. 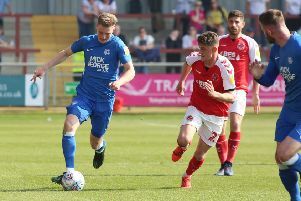 Moncur, though, was disappointed not to see Posh hold out for the win against a Vale side which had barely threatened before their late equaliser. He said: “It’s really nice to get the goals but I was really disappointed because I thought that would have been 2-1 game over. That’s really unfortunate with the penalty last minute but I’m sure we’ll kick on from that. “If we keep playing positive and the football we can play I’m sure we’ll have no problem getting points. Moncur is also enjoying his move to Peterborough. He initially turned the club down in the summer to sign for Championship side Barnsley before moving to London Road on loan. He said: “I’m loving it to be fair. I’m really enjoying my football and hopefully I can keep showing people what I can do on the field. Next up for Posh is a trip to Bramall Lane on Saturday (September 17) to face an in-form Sheffield United.